Huawei E5573 is a new 4G mobile hotspot with LTE Category 4 technology, it supports the download speed to 150mbps and upload speed to 50mbps. On the front, there are two single LED indicators for battery and signal strength. The back-cover of Huawei E5573 is removable, and Huawei E5573 have the external antenna connectors. Like its predecessors Huawei E5372, Huawei E5573 works well on 4G/LTE network, while 3G and 2G networks are backward. Let’s have a look on the Huawei E5573 sub-models, which is currently tested and can be unlocked. 8. Other models can also be unlocked. 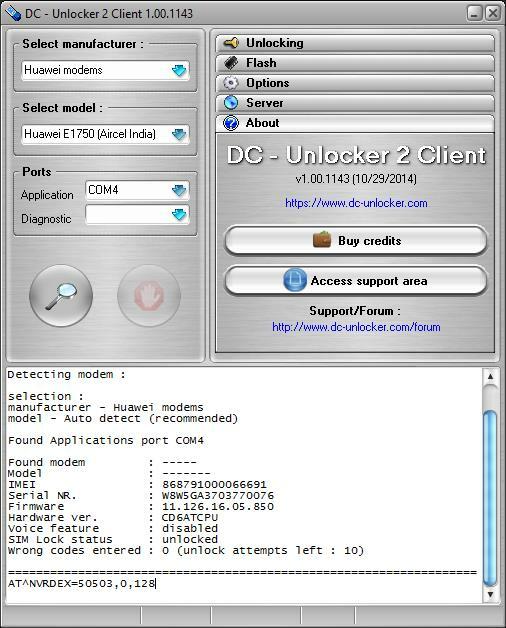 How to Unlock Huawei E5573s-508 Mobile WiFi Router. Once you have downloaded all the required files, you are ready for unlocking of Huawei E5573s-508 mobile WiFi router. Connect your Huawei E5573s-508 router to pc or laptop with its default USB cable. Extract all the downloaded zip file using WinRAR. Disconnect internet and close the webUI of the device. Run E5573s-508 Update 21.180.99.01.00 exe file. Enter the correct firmware code as password and wait till the finish of firmware update wizard. Note: PC / laptop will be not able to detect the device. Now install Huawei Mobile Partner. Wait till finish and if Huawei Mobile Parnter run in PC then close it. Launch the DC Unlocker as administrator. You will get some NV codes in hash format. Email the VN codes to unlockcode2016@gmail.com in a notepad format. The unlock code will be emailed back to you after payment. Note: Don’t use any free / wrong codes, factory unlock code is $9, you can pay through PayPal or Bitcoin and mention model with IMEI in the transaction. I will reply ASAP with factory unlock code or NCK.